Home alarm keypads: Not to be taken for granted. In modern home security systems, the alarm control keypad is the brains of the system. Security Tip: Since most alarm keypads have panic buttons, consider adding an easy-to-reach keypad console in your bedroom. The alarm keypad, sometimes called a security alarm console, is the focal point of your home protection system, as well as to a rapid-response monitoring center if you have opted for one . On the contrary, just like the keyboard is to your home computer, alarm keypads function as the interface to all your installed security devices. All alarm functions, as well as system status, can be observed and controlled through alarm keypads. Colored lights indicate alarm status such as 'ready', and 'armed', or a security zone that is open or alarmed. It may be used to remotely arm and disarm some burglary and fire alarm panels. Voice keypads are also being offered as well as touch screen keypads. Nowadays, there are keypads that not only have a nice appearance, but have tons of advanced options. Gone are the days of the basic plain beige or white keypads with little to no options. Now you have more options available when it comes to keypads. One simply presses an alphanumeric keypad, inputting a simple code to arm or disarm a home or car alarm. An alarm keypad is a touch device that one uses, much like a touch-tone phone. Alarm keypads make security easy and reduce the risk of theft. It may be used to remotely arm and disarm some burglary and fire alarm panels. 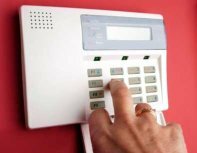 Just like the keyboard is to your home computer, alarm keypads function as the data entering interface to all your installed security devices as well as a display of the alarm system status.